Is it possible to fall in love with an old childhood comic book property like 'Archie' all over again? 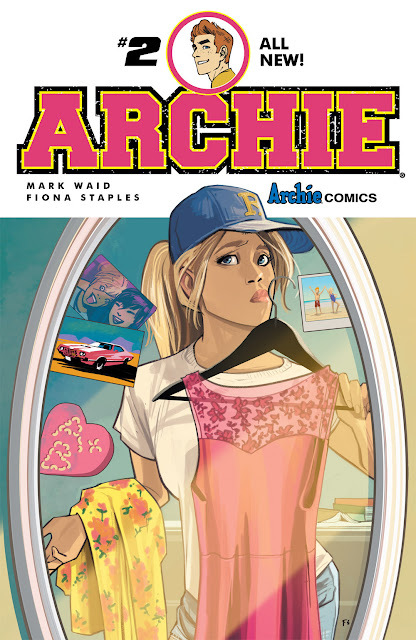 With Mark Waid writing a charming script and Fiona Staples designing diverse modernized characters 'Archie' #1 was a bonafide hit and love was reignited. Now with issue #2 we get to know these updated Riverdale kids a little better only to find the spirit and essense of what made them fun and endearing still remains true. The luxury of A-list talent like Waid and Staples on 'Archie' is the symbiotic relationship they immediately find in establishing breezy pacing, natural expository dialogue and charasmatic expressions. In classic fashion, Archie's beat-up ride needs work and he needs to get paid. He searches for work only to meet disastrous ends one job after another. His signature clumsiness is an important plot point that rings true to his character. Meanwhile, Betty is trying to move on after her break-up with Archie only to find a surprisingly creepy Trevor misunderstanding her intentions. Betty is in a funk and she's never been more relatable. Sheila is there for her trying to cheer her up and help move forward. It's wonderful to see such supportive friends from both sides. There's no manufactured drama between friends. They, as they've always had, have each other's back. There's plenty of moments of quick concise character development that informs you of each personality. Reg, Dilton, and especially Jughead. His backstory from rags to riches and back to rags is particularly funny and a little poignant. Waid's genuine care for these kids is evident in keeping to what made each personality so vital to the whole world of 'Archie.' There isn't a false moment and so accessible to new readers while embracing long-time readers back into the fold. We finally get a glimpse of Veronica and she is gorgeous. Duh! Archie catches a look as well after virtually destroying her dad's construction site. All the elements that made Archie an enjoyable read as a child are here albeit with a more mature but no less fun approach. The punny banter, the sight gags, the screwball comedy is there but the campiness is pulled back. prime example of that. And Waid is smart enough to keep the word balloons at a minimum, letting Staples do her thing. It's all brought to life with such vibrancy by colorists Andre Szymanowics and Jen Vaughn. It's a shame Staples' run ends with issue #3. That's no slight of Annie Wu who'll do the art for issue #4 or Veronica Fish who'll work on issues #5 and #6. Once you've been spoiled by Staples it's hard to let go. 'Archie' #2 reinforces the magic that began in issue #1. It reminds you why you got into comics to begin with. Whether you're rediscovering old friends or finding them for the first time on this new run, Archie and the gang have never been more accessible and enchanting than right now.